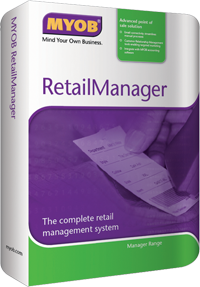 MYOB Retail Manager is a complete retail management system - keeps track of supplier, customer, stock, staff, sales, profit, . . . When you're in retail, time is of essence. Your cashier must be able to process sales in a jiffy, and send the customer away happily. MYOB RetailManager allows you to set up low level stock warnings, and automatically create purchase orders for stock that has fallen below its minimum quantity. Run stocktake on whole store, part of store, or a single item. Run promotions with ease - set up your start and end dates, and MYOB RetailManager will adjust promotional pricing autmatically. Know your inventory balance at any time. Never run out of stock. Don't overstock. and all businesses with lots of inventory.